werdna world - welcome to werdna world! Two more expeditions have been made beneath the Raven Hill watchtower. First, a party went back to the watchtower to seek out & destroy the creature Rikard (who they met in session 1). The party returned to the watchtower, intent on killing Rikard. They busted the door & were attacked by giant ferrets, leading to Ymar having his arm broken (though quick magical work from Terg saved his life. Once the ferrets were vanquished, they continue through the trapdoor down into the depths. The strange red underwold torches were all extuingished. In Rikard’s old room they met Ornir, a flunky of some kind who passed them a message from Rikard, but was convinced to join them in killing the bad guy (he seemed to have a grievance against his boss). Next, a party led by Lem the Fighter went into the halls beneath the watchtower, and chose to explore beyond the skull door. There they found several sarcophagi, sealed chambers, catacombs, and a room with a large mosaic depicting the life of a bug-eyed dead man. One corpse came to life and was exterminated. They found an emerald in the lid of a tomb, and a magical dagger, but beat an ordered retreat when assailed by skeleton guardians of the crypts. Session reports are available for session 2 and session 3. There is also a Campaign Log with summaries and links to the individual reports. And the chat logs are on the Discord server as usual. The next expedition heads out next Sunday! Since I’m using a static-site generator I don’t have an easy way to add comments to these posts. I’m going to experiment with running a simple forum where discussion may happen. So without further ado: acodispo.net message board! I’ll hope to post there whenever I do a new blog post here. The first session of the Werdna World Open Table was yesterday. Five treasure-seekers ventured up the ridge of Raven Hill looking for a cave. They found a broken watchtower with a new door on the exterior, and a trapdoor within. Beneath the trapdoor: a spiral staircase that led them deep into the earth over ancient stone steps. At the bottom they surprised & overcame two strange & troubling small-man-sized creatures, but one escaped to draw reinforcements. The reinforcements were burned & held off with a smashed lamp fueled by extra oil, and the lone survivor interrogated to little success. Some of the creatures speak the common tongue, but others speak only their only strange gibber. Pressing forward, the party came upon a much taller, more menacing specimen (apparently called Rikard) which conversed in the common tongue, then threatened them. The party slew another smaller creature on the way out, but Rikard was unharmed. The party beat a retreat at this point & returned to Haven Town with some combat under their belts & a strange tale to tell. The five survivors have gained experience, and indeed, have attained 1st level and chosen classes. We now have 3 Fighters and 2 Sorcerers. A session record is available. And the chat log is on the Discord server if you care to read the actual play. Plans will soon be under way for session two, and there are always seats at the digital table! I’m starting an open table game February 10th (this Sunday), and I’m writing a series of articles about how I’m going about preparing for the game. After the game starts I’ll continue the series with articles about how play progresses. Last time I wrote about the character creation process I’m using for this campaign. Today’s topic is the bare-bones “setting” I’ll have in place for the first session, and a bit about how I intend it to grow during play. For the past few years I begin most of my campaigns in the same way, essentially creating a new version of the same campaign setting for each game. Continuity is generally preserved during a particular campaign (i.e. with the same gaming group), but I want each new group to have their chance to spin the world off in an interesting direction, and I also want to give myself a fresh view on the setting, so I do a “reset” for each separate game group. At this point, I know Haven Town fairly well. It serves as the PCs’ home base, and is considered safe (i.e. any expedition can begin or end there without risk). Multiple groups have spent varying amounts of time in Haven Town over the years. Interesting NPCs have been developed, and a bit of the landscape of the town, but for each new game I give myself permission to change these details in response to the particular happenings in th new game. Raven Hill is a large enough feature to house multiple dungeons, and indeed it does! There are several entrances from the ruins on its peak, and from caves (hidden and obvious) along its shoulders. I usually place the same few dungeons upon Raven Hill, but again, I give myself permission to change these up depening on how things develop. For this open table game, the first session is going to begin at the entrance to one of the dungeons on Raven Hill. The Town of Brack, and the other mysterious features on the map, are meant to be hooks that draw the players out into exploration of the wilderness. Brack is in dangerous territory (a swamp), and it is placed far enough from Haven to entail a non-trivial expedition for beginning characters. There are also rumours that Brack itself is dangerous and crime-ridden. The precise nature of Brack, of course, will be determined during play. For the other features, I try to come up with new ones each time. The above is the limit of what I’m going to write about the setting before the first session, and probably for a while after that (though this will depend on what expedition the players choose for sessions after the ifirst). My primary aim in using this structure are probably pretty clear: I want to give the players lots of interesting places on the map to explore once they tire of exploring the first dungeon (which is itself placed a little way outside town). In starting afresh with each game group, I’m also giving myself some fun: I like to play to find out what happens just as much as the players (hopefully) do. 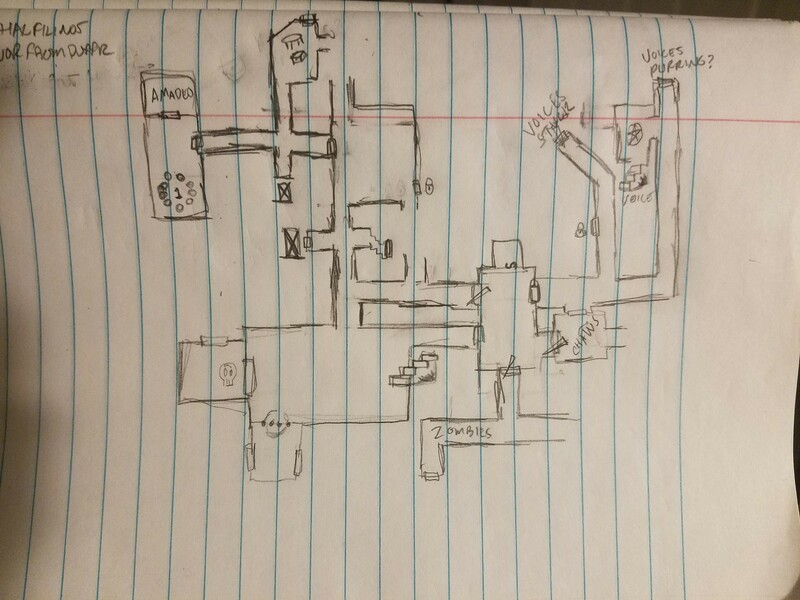 Though I can guess, with pretty good accuracy, what is behind most of the features on the map at this point, I don’t set it for sure (write it down) until I’ve had a little input from the players – just in terms of seeing what kinds of places they want to explore, what kinds of problems they want to solve. If the players end up returning again and again to the first dungeon until they’ve cleared it entirely (though that would take some doing), I probably won’t add too much detail to the wilderness features for some time, though I may add a bit of background to Haven as they spend time there recovering & preparing. Needless to say, every feature on the map is as full as Raven Hill: there are dungeons even within the town of Haven, if one cares to look. There’s plent of room for this world to expand down as well as out. In the next article I’ll take a look at the first dungeon on Raven Hill. I’m starting an open table next Sunday, and this is the first of a series of companion articles here on my blog. I plan to cover mainly how I’m going about planning for this campaign setting, especially as it regards my practice of “just-in-time planning”. Today’s topic, however, is how I’m handling character generation for this campaign. As I mentioned above, the campaign is an “open table” setup. As GM, I post the dates & times when I’m open to running a session. Players then sign up to play in that expedition. Expeditions begin & end in a “safe haven”, e.g. the starting town, so there’s no need to commit to joining each weekly expedition. Whoever is available ventures out that week. The rules system is what I’m calling “OD&Dish”. It’s basically original edition D&D, just the three little brown books, & none of the supplements. I’m using Delving Deeper as my primary reference, but I’ll also refer to the three booklets themselves, and will introduce house rules as they occur to me. These rules tend to create delicate characters, and to exacerbate this effect, I’m creating characters at 0-level (more on this in a moment). The combination of open table (not knowing who might be playing very far ahead of time), and delicate characters, means that I want character generation to be very quick. I also want the game to be easy for new players or even first time players to jump into. Therefore, I’ve chosen to make character creation completely random for beginning players. I then ask the player to name the resulting character. As I mentioned above, characters for all players start out at level 0. They have a single hit die, but no class. The process takes about a minute, and can be used to quickly generate a new character for new players or for a player whose character has fallen. I like it because it generates interesting, often paradoxical characters. E.g. great Srength, very little hp. Or little hp, but heavy armor. Etc. Asking the players to provide the name often solidifies the character in interesting ways, suddenly providing, for example, an idea of gender, background, personality, and even vocation, all of which might be completely different from what I might have assumed the character would be about given their ability scores. James’ background tables are excellent: they are evocative but leave plenty of room for interpretation. I chose the relationship & raised-by tables because they create a concrete bond to somebody in the world (though who knows when we shall meet them), and they tell us just a bit about where this character is coming from. Any other detail I leave to the players, though at this point most seem quite content to see what happens to these oddballs in their first expedition, without adding further detail. Once a character survives their first expedition (i.e. makes it back to a haven) the players gets to choose a class (Fighter, Thief, Magic-User) for the character, and the character comes just a little bit more alive. Once a player has raised a character to level 3, they can (at their option) create new 1st level characters (i.e. characters that begin with class), and they need not be determined entirely at random. We’ll see how we feel about the above rule when we get to that point in the campaign. The next article is going to cover how I create extremely minimal setting for this campaign (a practice I’ve been following with pleasant results for a few years now). Brad wrote about locating the creative burden in RPGs: is it primarily on the ref, or the players, a mixture of both? The following are my free-writ thoughts in response. I’ve played a fair number of games (including a couple of Brad’s) where the creative burden is explicity shared out among the players & the ref to some extent. I’ve played games where there is no ref & the rules share the burden out among the players all on equal grounds. From my point of view, the creative burden is being spread around the table in most games that I play, including DnD. It’s not that a player has less creative responsibility than the GM, it’s just a different kind of responsibility. I should say at the start that the “rulings-not-rules” maxim & associated discussion has never held much meaning for me. From my point of view, early DnD has plenty of rules, and I don’t find myself needing to exercise a lot of creativity in order to apply them in any given situation (i.e. make a ruling). Thus, I don’t feel the GM has to fill up gaps in the rules by creatively applying rules. I’m more interested in the creative burden of generating setting & narrative (or I might say context & movement). In DnD the ref seems to hold a lot of the creative burden because they are responsible for the setting the PCs are to explore, and for making that setting feel alive during play (context & movement). But the players have a huge creative burden as well: they participate with the GM in making the setting real (by active listening or engaging with visual aids like drawings or miniatures), and then they must take action within that context by imagining either what they or a very specific fictional person would do in that context. And I think my response is that the creative burden in DnD, as I have played it for the past several years, is fairly evening spread out between the ref & the players, but that the specific nature of the burden is asymmetric: the GM creates a fictional world & its reactions to player action, while the players actively (& creatively) receive that world, and create their PCs actions in response to it and in context of it. My background is in theatre, and I spend much of my life finding space for my own creativity around a script. No one doubts that an actor shows great creativity & shoulders a heavy burden when interpreting the words of a playwright. The player’s burden in an RPG is similar. However, while I almost always feel myself to be creating in collaboration with a playwright, how much more so is a player creating in collaboration with the GM? My playwright may be completely inaccessible to me as a person – in fact most of my work is done in collaborate with Mr. Wm. Shakespeare, who’s been dead four hundred years and is very inaccesible as a person at the best of times due to his damnable aura of mystery – whereas the player sits at table with the GM, sharing the air they breathe & the vibrations of voice in the room. To come around to a conclusion, I’ve always felt the creative dynamic of RPGs (including DnD) to be very much a two-way street, or more accurately an agora of the table, where creativity is shared. DnD is like a theatre production: the rules & setting are the script, a sturdy framework; the DM is the director, responsible for speaking for the rules & setting and keeping an eye on the overall effect; the players are the actors & other individual craftspeople, each with their part to play. (Arguably) there is no production without the script, the director, or the actors – they share the burden in order to create the thing. But it’s always a collaboration. Starting on February 10th I’m going to GM a weekly game via Discord text chat. You’re welcome to join as a player, or as an observer if you wish! The rules will be something in the neighborhood of OD&D (no supplements), with Delving Deeper v4 as the primary reference text. Characters will be generated at random & start at 0-level. Play will focus on exploration of dungeons & wilderness. I’ll start this campaign (as I usually do) with a very bare-bones setting, in this case just a dungeon & a safe town. The setting will evolve just as the rules do: in response to play & the particularly the players’ actions. I plan to post on this blog about the setting creation process & the house rules. I may also post session reports here. Hope to see you in Werdna World!